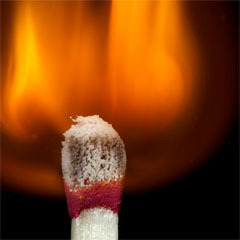 A chemical reaction: combustion. Creative Commons Attribution-NonCommercial-ShareAlike image by David Lindes. Conservation of mass: This concept was formulated by Antoine Lavoisier (who we've met before) in the late 18th century, following his work on chemical reactions. In any chemical reaction, the mass of the materials before the reaction is the same as the mass afterwards. You need to be careful (as Lavoisier was the first to do) to consider the masses of any gases involved as well, by doing the reactions in a sealed container. Conservation of energy: This concept came through the work of James Joule (who we've also met before, in the same annotation as Lavoisier) in the mid 19th century. Joule discovered that heat was a form of energy, and that there was a fixed equivalence between heat and kinetic energy (the energy of moving objects). This led to the principle that energy could be converted from one form to another, but was never created nor destroyed. These were great principles, and allowed us to figure out all sorts of marvellous discoveries about the natural world. But a few niggling things still hovered tantalisingly beyond our comprehension. One problem in particular seemed a bit esoteric to most people, but was a major concern across all fields of science: what made stars shine? Stars emit a lot of energy in the form of light, heat, and other electromagnetic radiation. Where does it come from? In 1900, the best answer anyone had was that the energy came from a gradual contraction of the star under gravity, which would reduce the gravitational potential energy of the star. The problem was we knew the sizes and masses of stars, and how much energy they produced, and if you run the numbers, gravitational contraction only has enough energy to supply a star like our sun for a few million years. But this was at a time when the fields of biology and geology were both piling up evidence that the Earth must be hundreds of millions of years old, if not thousands of millions (i.e. billions, in the American counting system). Charles Darwin's theory of evolution by natural selection was quickly gaining favour, and it required many millions of years to produce the diversity of life in evidence all around us. And the evidence from rock formations all over the world pointed to hundreds of millions of years being necessary to explain them. 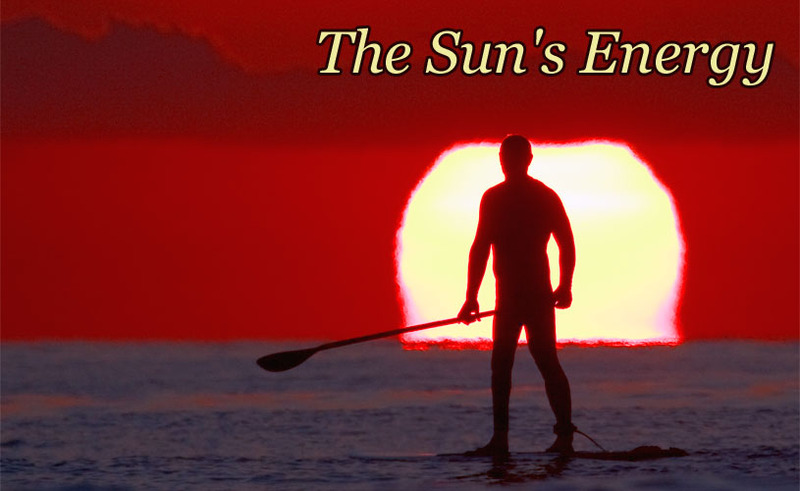 But the only theory we had for the age of our sun pointed to an age of about 10 million years, maximum. Something was wrong. 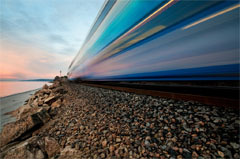 A speeding train. Creative Commons Attribution-NonCommercial-ShareAlike image by Doug van Kampen. When Albert Einstein formulated his special theory of relativity in 1905, he made several derivations regarding the behaviour of objects moving at speeds approaching the speed of light c. We've already looked at the first of those, time dilation. If two objects are moving at different speeds relative to one another, than those two objects measure time passing at different rates. In other words, two perfectly accurate clocks moving with respect to one another will get out of synch. Time dilation is not the only weird effect of special relativity. Relative motion not only affects time, it also affects distance. The effect is called length contraction. As objects move, they get shorter. Their length, measured in the direction of motion, shrinks or contracts. To give a concrete example, let's use a train again. Suppose you're standing still on a platform, and a train is rushing past. If you measure the length of the moving train, you would find that it is shorter than the length of the train when it is standing still. We need to be a little careful when we say "measure the length of the moving train" here. Set up a long ruler beside the track and have people stand at either end, roughly where the ends of the train will be, with synchronised clocks. As the train rushes past, at an agreed tick of the clocks each person marks on the ruler precisely where their end of the moving train is at that moment. The distance between the marks is the length of the moving train. And if you compare it to the length of the train measured when it's standing still, you'll find the length of the moving train is shorter. There are a couple of details here. Obviously this is an inefficient way to measure the length of something moving past at high speed, and prone to errors if you were to try it in real life. But conceptually you can see that if the people were really precise and could accurately pinpoint the location of the ends of the train at a given time down to tiny, tiny fractions of a second, it should work. The second point is that this change in the length of the train is not caused by any bunching up of the carriages due to slack at the couplings or anything like that. If it helps, imagine it's a bus, a single box made of metal. The change isn't caused by elasticity either, as though the train/bus was a spring that wobbles and gets shorter as you push it from behind. 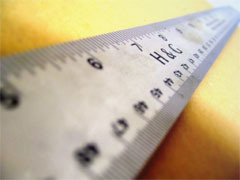 Measuring length. Creative Commons Attribution-NonCommercial-ShareAlike image by Chandra Marsono. This length contraction effect can only be measured by an observer not moving along with the object. If you tried to measure the length of the train while on the train, your ruler would have contracted by the same proportion as the train itself, so relative to the ruler the train is the same length. On the other hand, if you were on board the moving train and you measured the length of something outside, say the length of the platform, it will be contracted relative to you, since the platform is moving relative to the train. That's right: to someone on the platform, the train is shorter, while to someone on the train, the platform is shorter. Relativity can't tell which object is "really" moving and which is "really" standing still. As with all effects of relativity, length contraction only really becomes noticeable at speeds close to c. So we don't see it in our everyday lives, which makes it completely outside the realm of experience and common sense. But it's real and there are experiments that demonstrate it. When subatomic particles interact, the outcomes depend on the density of charge and matter. When a particle is fired at close to the speed of light, in a particle accelerator like the Large Hadron Collider, length contraction squishes it so its shape is more like a discus than a sphere, flattened in the direction of travel. This flattening changes the particle's charge and mass density. To correctly predict the interaction strength as it collides with a target, you have to use this relativistically compressed density. This touches on a third effect of travelling close to c - the effect on mass. Mass and speed combine to give kinetic energy, the energy of motion. And here is where Einstein made the astonishing discovery that became synonymous with his name. When deriving the kinetic energy and momentum of an object moving at speeds close to light, he found that the energy and momentum both ballooned quickly, tending towards an infinite value as the speed got ever closer to c. Einstein considered how energy and momentum are transferred between particles in collisions, and concluded that things made more sense if the total energy of a moving object was equal to its kinetic energy plus another term that was equal to the particle's mass times the square of the speed of light. 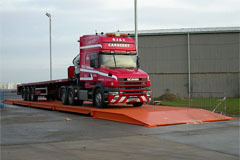 Truck on a portable weighbridge. Creative Commons Attribution-ShareAlike image by Wikipedia user Mostin89. Energy equals (relativistic) mass times the square of the speed of light. If Einstein's initial interpretation is correct, then going back to our train again, if there was a section of track set up to weigh the train (like a truck weighbridge), we could weigh the train as it stood still. But if the train was moving along the tracks, and the bridge could weigh the train accurately as it moved (in the fraction of a second that it was squarely on the bridge), we'd find the weight reading was bigger. Again, as with time dilation and length contraction, this effect is so tiny as to not be noticeable unless the speed involved is close to the speed of light. However, Einstein later expressed uncertainty on this particular point, and said that it was better to avoid the concept of relativistic mass and simply concentrate on the relativistic expressions for energy and momentum. Other physicists now argue that although Einstein's expressions for the energy and momentum of objects moving at high speeds are correct and—when compared to the expressions for kinetic energy and momentum in Newtonian physics—imply that the mass of the object has increased, they should not be interpreted as the mass of the object actually changing. Rather than the additional increase in energy and momentum (over Newtonian physics) coming from additional mass, it originates in the interactions of space and time. A nuclear explosion. 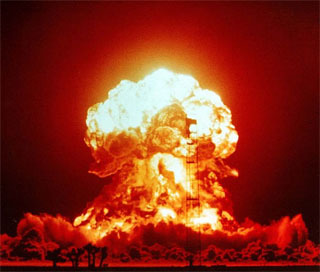 The BADGER explosion on April 18, 1953, Nevada Test Site. Public domain image from Wikimedia Commons. Unlike time dilation and length contraction, in which experiments have been able to confirm the reality of the changes, no experiment has been devised to test whether the mass of a particle moving at high speeds really changes or whether it's more an apparent change caused by the interaction of the moving object with spacetime. The high-speed weighbridge for our train turns out to be impractical. But the good point is that it actually doesn't matter whether relativistic mass is "real" or just an interpretation of some geometric property of spacetime that looks like a change in mass - the consequences on the physics are exactly the same. And, as Einstein pointed out, the most astonishing of those consequences is that idea that mass is actually equivalent to energy. Like kinetic energy, and gravitational potential energy, and chemical energy stored in chemical bonds, mass is a form of energy. Going back to the two principles we began with, conservation of mass and conservation of energy, we can now reformulate them into a single principle: Conservation of mass/energy. It's essentially the conservation of energy, just recognising that mass is actually one form of energy. Thinking about this, this implies that you can convert mass into other forms of energy, or vice versa, convert other forms of energy into mass. And the conversion rate is c2, which is an enormous number. Mass is equivalent to absolutely humongous gobs of energy. And suddenly, without even thinking about applications to astrophysics, Einstein had found the answer to what makes stars shine. Or rather, he'd found the scientific principle which can allow a star to generate enough energy to shine for billions of years. If a star can convert some of its mass directly into energy, that would easily provide more than enough energy. It took a few more years for astrophysicists to iron out the details. In 1920, Arthur Eddington used very precise measurements of the atomic masses of hydrogen and helium (made by others) to show that it was feasible that the sun could produce its energy entirely by converting hydrogen into helium in nuclear fusion reactions. In 1939, Hans Bethe published details of the exact reaction chain that would allow this to happen. If there's any consequence of Einstein's relativity that is established beyond any shadow of a doubt, it is the equivalence of mass and energy. This is the principle that allows stars to shine. It explains radioactive decay. It explains nuclear reactions in general. It allowed the building of nuclear reactors, and nuclear weapons. If relativity was wrong, these things wouldn't work. On the other hand, if relativity was wrong, our sun wouldn't be shining, and you and I wouldn't be here. Title image licensed under Creative Commons Attribution-NonCommercial by Michael Dawes. Last Modified: Saturday, 18 January 2014; 14:19:59 PST.